I wanted to send you a quick thanks to let you know I am a happy bait towel user. Thank you for your product. I recently moved to the East Coast and have been spending more time on the water and less on the golf course. I’ve found that the best way to catch fish is with bait and there’s nothing worse than having to wipe my slimy, smelly hands on my shirt or shorts. 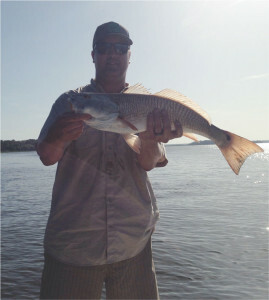 During my last trip out I landed my first redfish, it hit my bait quickly and I was thankful I had clean dry hands when it was time to reel him in! Looking forward to promoting your product to my friends!